Students from the class of 2016 celebrate the closing of Commencement with a throw of their caps. 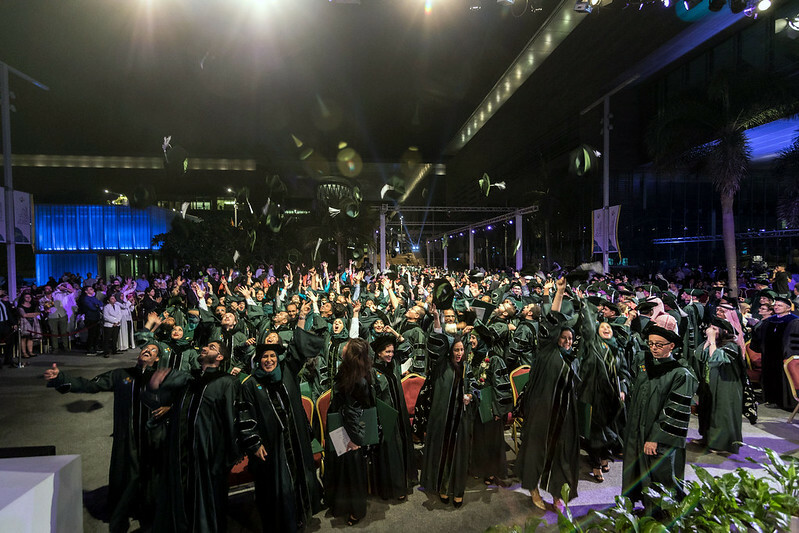 ​​​​​​KAUST welcomed 181 graduates into its global alumni community at the University’s seventh Commencement ceremony on December 16, 2016. Attended by members of the University’s board of trustees, senior leadership, faculty, students and the KAUST community, the ceremony saw 87 Ph.D. graduates and 94 master’s degree graduates receive their diplomas and congratulations from KAUST President Jean-Lou Chameau and other distinguished guests, including His Excellency Ali Ibrahim Al-Naimi, chairman of the KAUST board of trustees, and Commencement speaker Andrew N. Liveris, chairman and chief executive officer of The Dow Chemical Company. Liveris, a 40-year veteran of Dow, has served in diverse roles in marketing, manufacturing, engineering, sales and management in the company around the world, and helped orchestrate the creation of the Sadara Chemical Company, a joint venture between Dow and Saudi Aramco. He has also been part of KAUST since its inception, partnering with the University to invest in local talent and develop solutions to regional and global challenges, for example through Dow’s expanding facilities at the KAUST Research & Technology Park. “I can tell you from experience—40 years of experience—that your path forward from here will not be direct,” Liveris told the graduates. “I am a great believer in seeking, as I have come to call it, your North Star, and really looking for a purpose that will motivate you, guide you and give your career and life a sense of direction. KAUST Commencement 2016 (Full ceremony) from KAUST Video on Vimeo. Class of 2016 student speaker Hessa Al-Quwaiee, a Ph.D. graduate in electrical engineering, echoed Liveris’ words in her remarks. Al-Quwaiee shared a personal story with the audience of her brother’s death in 2015, just 10 days before her Ph.D. proposal. “I’m not sharing this story of loss with you to make you sad,” Al-Quwaiee said. “I share it because the loss taught me three life lessons the hard way. First, never leave work to the last minute. Second, express gratitude to family, friends, faculty members and colleagues—to everyone who supported you to reach this point. Finally, life goes on—maybe not the way you hoped or planned, but tomorrow will come, and with it a new set of challenges and opportunities. In his charge to the Class of 2016, Chameau encouraged graduates to carry the KAUST culture of excellence with them in everything they do.